Well, obviously (cough), there's no way (Hosea!) the Pope said this. Indeed, given that Eugene Scalfari is so 'creative' with the truth and apparently just makes up his own mind what the Pope has said from memory having interviewed him, why should we even believe that this interview even took place. If Scalfari isn't a trustworthy reporter of people's quotations, should we even believe the story that this interview happened? The above video is the latest footage that has arrived during the Revolution of Tenderness TM. If you can't see the moment of heartmelting tenderness in this video it begins at 1min 45sec in the video below and is over very quickly. around a bit by the Great Reformer. Some people have received the highest honour the Church can accord, that of being mown down by the Pope's vehicle. Pray for Henry Sire, author of 'The Dictator Pope'. Pray for his protection and the protection of all those who are determined to stand in the way of the juggernaut of FrancisMercy. Until Easter Day, I wish you a blessed Holy Week. ...to all readers of this blog. Found a couple of gems on Twitter. 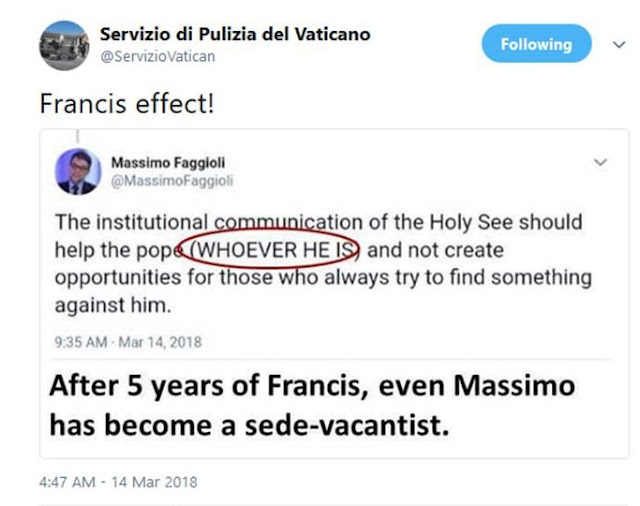 It would appear that Massimo Faggioli and the Vatican Cleaning Service are united in their concern about the redacted letter fiasco. We have some 'interior continuity' here, I think you'll agree! 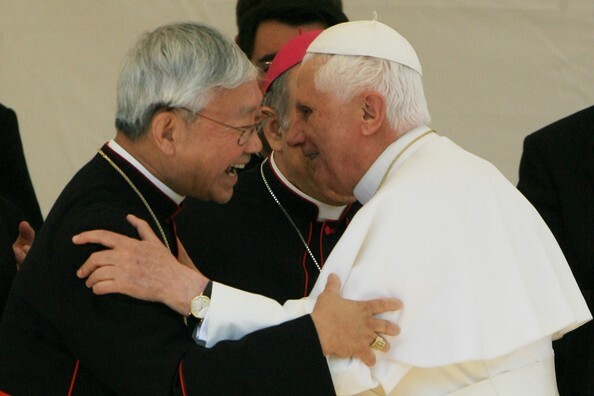 Benedict XVI also had some mediocre and untrustworthy men hovering around him. Interior continuity is go! Once you've lost the support of the cleaners, though, its all downhill from there, especially when they are responsible for polishing floors. Then there is the Vatican Post Office, but I guess they lost enthusiasm after the Great Book Heist of 2014 at the officially 'trust us on this' unrigged (thanks for that clarification, Cardinal Lorenzo Baldisseri) Synod on the Family. Thank you for your kind letter of 12 January and the attached gift of the eleven small volumes edited by Roberto Repole. The small volumesshow, rightly, that Pope Francis is a man of profound philosophical and theological formation, and they therefore help to see the inner continuity between the two pontificates, despite all the differences of style and temperament.